Chris hosts an evening of short presentations by local birders. La Villette Hotel (Perry’s page 30 A2). Members and non-members welcome. 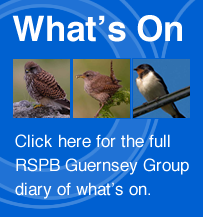 Entrance is £5 for non-members (RSPB members £4) and includes coffee/tea and biscuits. Members from the group and La Société Guernesiaise team up and scour the islands spotting and counting as many bird species as they can. This is a sponsored event raising funds for both groups. Contact Mike Bairds on 255524 for a sponsorship form. Meet at the Scramble Track car park (Perry’s page 32 C4) for a walk around the headland in search of early migrant birds. Meet at the car park (not the one next to the playground) (Perry’s page 15 G1) for a walk around Saumarez Park and nearby lanes. I’m very pleased to report that our Facebook page is a great success with 258 members in just six months. There have been some excellent pictures posted and we’re building a great community space for sharing stories. We would love to hear from you as it’s a space for you to enjoy. If you want to share but you’re not proficient on Facebook let the committee have your story and we’ll post it for you. After some 25 years our lovely Dee has decided to retire from our committee. She is not only a lovely person to work with but has given an enormous number of voluntary hours to the RSPB. Dee ran our youth section when her own children were young and then continued as a very active member of the main committee. She’s been crafty over the years making lots of little trinkets and cards to raise funds at events. We will miss Dee very much and wish her well as she retires to spend more time with her family. We do have a new chap ready to join the committee, but we’ll announce his appointment once the paperwork is in place. Mike Bairds would like to reduce some of the tasks he has so we’re looking for a Membership Secretary. Mike will continue with all the many other jobs he does – thankfully! We’re also looking for a Treasurer so that Anne can finally put the calculator away and take a rest from counting the pennies. If you’re interested in any of those roles, we’d love to hear from you.